Full disclosure: as much as butter, sugar, and baking are my “jam”, cheesecake is not my jam. It’s not like cheesecake is gross to me (like flan), but as far as desserts go, it’s really low on my list. To me, it’s too rich and often a lot more work to make than it’s worth. That said, it’s one of my husband’s absolute favorite desserts so, because I love him, I make him a cheesecake every year for Valentine’s Day. 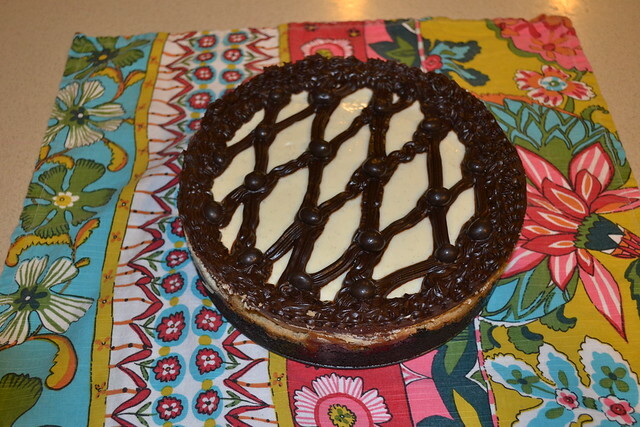 This year was our TENTH Valentine’s Day together, and though there have been some cheesecake winners in the past, this one was my favorite – to the point that I might consider making 2 per year. Cheesecake is an inherently difficult dessert to make, and this is no exception. It’s a lot of work because there are four layers of goodness involved, but none of the steps are too challenging. 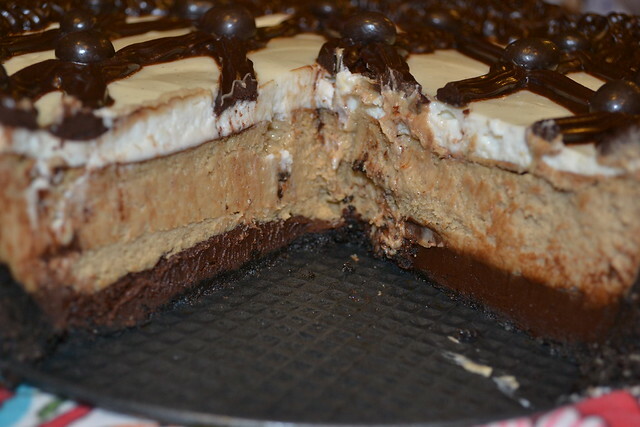 The chocolate-covered espresso beans aren’t crucial to the cheesecake and I’ve heard they can be hard to find, so if you can’t it’s no problem. I found them in the bulk foods section of a local store, and I’ve gotten them at Trader Joe’s before. Be sure to allow plenty of cooking and cooling time – you might even want to start a day early. The cake is good for a solid week covered in the refrigerator (maybe more, ours was gone by then). 1. Set the cream cheese out to soften. To make the crust: twist the oreos in half and discard the cream. Place the cookies in a food processor to make a very fine crumb. Melt the butter and add stir the butter, oreo dust, and salt together in a medium bowl. Press the mixture into a 9-inch springform pan completely covering the bottom and coming up about halfway up the sides. Put the crusted pan in the refrigerator until you’re ready to pour in the ganache. 2. To make the ganache: in a small saucepan, heat the heavy cream to a simmer. Place the chocolate in a medium bowl and, once the cream is simmering, pour it over the chocolate and stir until the chocolate melts. Add the liqueur and stir until incorporated. Pour about half the mixture into the springform pan, just make sure the chocolate doesn’t come above the crust. 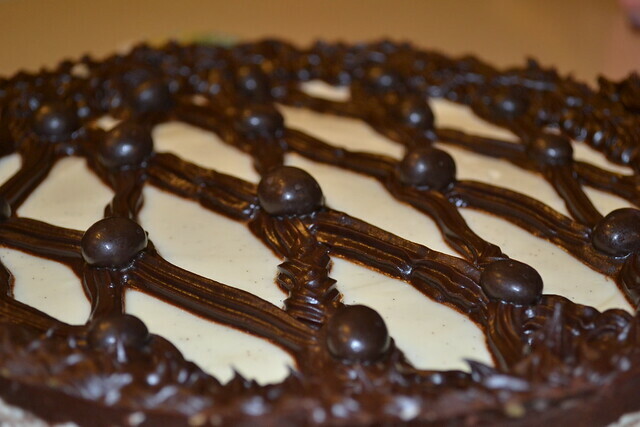 Reserve the rest of the ganache for topping. Return to the refrigerator. 3. Preheat the oven to 350 with the rack in the middle. To make the filling: beat the cream cheese and sugar together until smooth. Add the flour, rum, espresso powder, molasses, and eggs, one at a time, beating until incorporated. Pour the mixture into the pan and place on a rimmed baking sheet before placing in the oven. Bake for 45 minutes to an hour – until the top is puffy and starting to pull away from the edge of the pan. Remove from the oven, but leave it on while you prepare the topping. 4. To make the topping: beat the sour cream, sugar, and vanilla together until smooth. Carefully spread over the top of the cheesecake, using a spatula to smooth. Return to the 350 degree oven and bake for 10-15 more minutes. Allow the cheesecake to cook for at least half and hour, then pipe the remaining ganache over the top and garnish with espresso beans. Be sure to pipe along the edge to give it a nice side view. Then move to the refrigerator (or freezer, if you watch carefully) to chill for an additional several hours until completely cool and set. Carefully remove the springform and cut with a sharp knife.